← Grand Canyon: Day 5- Bright Angel Snowstorm! 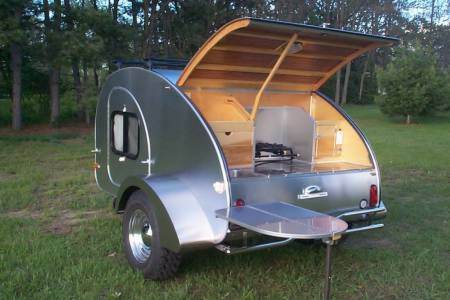 On Saturday, I saw something so cool, I’ve been fantasizing about it ever since: a teardrop travel trailer! The front has a queen-sized sleeping compartment and the back is kitchen/ galley/ storage space! With the right building materials, Teardrops are light enough to be towed by motorcycles and lightweight cars. A mechanic friend of mine assures me the Subaru can handle a Teardrop, no problem, with probably less reduction in gas efficiency than with my rooftop carrier. I’ve been scheming about spending the summer on the road and a place to sleep, read and work comfortably, out of the weather, and the space to cook real meals would really help make living on the road more enjoyable and sustainable. It might even be cheaper, if it means fewer hotels and restaurants. New models are fancy and pricey, but I’ve found a handful of used Teardrops on Craigslist for less than $3,000. This entry was posted in Road tripping!, Sustainable Living, Vagabonding 101 and tagged Teardrop, trailer. Bookmark the permalink. You could stop at truck stops for showers… I’m sure you’ve already got that figured out. That trailer is tiny! But, yes, just a place to sleep, and then, cook your food would save beaucoup bucks! Cool! Good choice. I have looked at the same thing and am saving for one. These are super-sweet! I prefer a Volkswagon camper vans, or oh my goodness, a toyota or Datsun camper WOWZERS! But these are just so darn cute! Good Luck! So glad to see what your teardrop is like. My husband and I are thinking of doing some extensive road trips and have looked into tent trailers, but most of them are too heavy for our Subaru Forester. Maybe teardrop would be right for us, also. I’ve been toying with the idea of using a teardrop camper for more than 2 years. My son and I are planning to attend the “20th Dam Gathering of the Tears” on Lake Shasta in Northern California in Early may. This will give me the chance to look at all the teardrops and decide once and for all if it will work for my needs. They will be building a complete teardrop trailer during this 4-day event from start to finish. I’m particularly drawn to watching at least some of this build as I plan to build my own. We’ll see how it goes. have fun with yours. It looks like a nice one. Thanks so much for this information, it gives me energy to go out and meet more folks that are doing this! I think the Baby Boomers, like myself, must be a large part of this group of travelers? My Mother is 84, and jealous in a loving way, of my new Trekking. I get my gypsy ways from her. I’m so excited to get On the Road Again, hmm sounds like a song, don’t ya know! I would love to take my “Dog Behavior Training” Skills on the road, to pay for my trips! Anyone have an idea?